Explore one of the Seven Natural Wonders of Africa with this list of quick facts that you may not have known. 2. The greater Serengeti ecosystem includes Serengeti National Park proper; Ngorongoro Conservation Area; Maswa Game Reserve; Loliondo, Grumeti, and Ikorongo Game Controlled Areas; and the Masai Mara National Reserve in Kenya. 3. 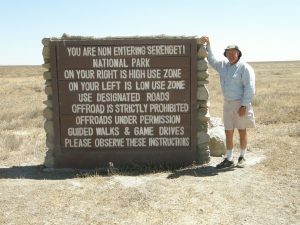 The name, Serengeti, is derived from the Maasai word siringit, meaning “endless plains.” An accurate description considering the whole ecosystem stretches over 12,000 square miles (30,000 square kilometers)! 4. The Serengeti is home to the world’s largest movement of animals, often called the “Great Migration.” More than 1.7 million wildebeest, 500,000 zebra, and 200,000 antelope make their way from the Ndutu region of the southern Serengeti northward through the whole length of the “endless plains” to Kenya’s Masai Mara (a total of 500 mi / 800 km). This cyclical migration begins in March (after the annual birthing of the calves at Ndutu in February) and ends with their return in January, following the annual cycle of rains and fresh grasses. During this time around 250,000 wildebeest alone die from thirst, hunger, exhaustion, and predation. 6. The Maasai tribe had been grazing their cattle in the Serengeti plains for around 200 years when the first European explorers arrived. German geographer Dr. Oscar Baumann entered the area in 1892. The first Brit to see the Serengeti, Stewart Edward White, recorded his explorations in 1913. The first partial game reserve of 800 acres (3.2 sq km) was established in 1921 and a full one in 1929. These reserves became the basis for Serengeti National Park, which was gazetted in 1951. 7. 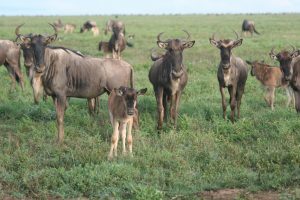 In the 1890s, droughts and a cattle disease wreaked havoc on the Serengeti wildlife population – in particular to wildebeest. It wasn’t until the mid-1970s that the wildebeest and buffalo populations had fully recovered. 8. Apart from rhinoceros, decimated by poachers, and hunting dogs, which are slowly declining, you will readily observe every species of African savanna mammal within the Serengeti. It is the best place in East Africa to see predators in action – because of the open grass plains where the grazing animals gather, predators are numerous and easily visible to the safari-goer. 9. Spread throughout the south central Serengeti, kopjes (pronounced like “copy”) are geologic wonders comprised of exposed gneiss and granite shaped by the wind and temperature fluctuations. 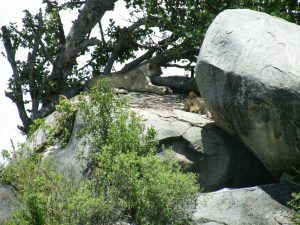 With sun-warmed rocks, vegetation for shade, and their elevation several meters above the plains, kopjes are a favorite resting spot for lions. It seems that one particular Serengeti kopje, known as Simba Kopje, was the inspiration for Pride Rock in Disney’s The Lion King. 10. In 2010, the government of Tanzania announced plans to build a 53 km commercial highway across the northern section of Serengeti National Park. If completed, the highway, which would speed the transport of people and goods across the country, would also have negative impacts on the ecosystem. The highway would encourage settlement, invasive species, human-wildlife conflict, poaching, disrupt migration routes, and fragment the ecosystem. While the “Serengeti Highway” is presently blocked by the courts, its eventual construction is not without possibility.